The US faces $21m (£10.6m) in annual trade sanctions as a result of its online betting ban, the World Trade Organization has ruled. Antigua and Barbuda was awarded the right to impose sanctions that target US services, copyrights and trademarks. Laws passed in the US in October 2006 effectively made it illegal for foreign internet gaming firms to trade there. But in March the trade body delivered a final ruling saying that the US online betting ban was illegal. Antigua had hoped to impose $3.4bn in retaliatory measures against the US and the amount awarded was described as a token gesture, given the massive size of the US economy. The US said that Antigua's claim was excessive and more than three times the size of Antigua's entire economy. "The United States is pleased that the figure arrived at by the arbitrator is over 100 times lower than Antigua's claim," said Sean Spicer, a spokesman for U.S. Trade Representative Susan Schwab. Antigua, a former British colony of about 80,000 people, had been promoting electronic commerce as way to end the country's reliance on tourism, which was hurt by a series of hurricanes in the late 1990s. The Caribbean nation is the smallest country to litigate a case successfully in the WTO's 12-year-history. The case had drawn the attention of US industry because Antigua has threatened to target US trademarks and copyright, which could make the nation a safe haven for intellectual property piracy. The ruling could "establish a harmful precedent for a WTO member to affirmatively authorise what would otherwise be considered acts of piracy, counterfeiting or other forms of ... infringement", the US said. The US and Antigua cannot appeal against Friday's decision. Mark Mendel, the lawyer who led the case for Antigua, said that the country was unlikely to violate US copyrights. "Antigua doesn't want to negate American intellectual property rights. They don't want to sell ... DVDs and copies of Microsoft Office." Last year the US stopped US banks and credit card companies from processing payments to online gambling businesses outside the country, effectively killing off the market for overseas gambling firms. 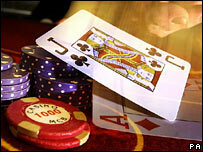 About half of the world's online gamblers are based in the US, and the market is estimated to be worth $15.5bn. Earlier this week, the EU said the US would offer its member countries trade concessions as compensation for its refusal to lift internet gambling laws.